MoneyMutual Reviews - Legit or Scam? MoneyMutual Reviews – Legit or Scam? 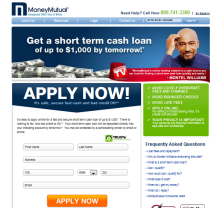 MoneyMutual is a website that provides matching services for people interested in payday cash advances, auto equity loans, or other types of short term installment loans. MoneyMutual may be most recognized for their commercials featuring Montel Williams, promising that they are a trustworthy source that can find anyone a short term loan quickly and easily. If you are interested in a short term loan between $200 and $1000, have employment and an active bank account, then you may be eligible to be approved for a short term loan in just minutes, with the funds being deposited into your account by the next business day. Short term loans are provided to those with bad credit, or no credit, who are not eligible for more traditional loans through larger financial institutions. These loans are intended to be paid back right away, often within 2 to 4 weeks. Unfortunately, because these loans are often granted with very little restrictions, the interest rate and fees are very high, and can be difficult to pay back. MoneyMutual is just a lender matching service, however, and not a lender. Once you have accepted a lender’s terms and rates, you will need to direct all questions and problems to the lender you have contracted with. MoneyMutual can connect their clients with over 60 short term loan lenders, who have the ability to make real time decisions about providing you with a loan, so that you may have the funds directly deposited into your bank account by the next business day. MoneyMutual is a free service, and will cost you nothing to use. You are also able to see what lenders are able to offer you without any obligation to accept the loan, or the terms and conditions provided by the lender, until you are sure you want to. Their lenders offer installment loans, lines of credit, title loans, and auto equity loans. If you have any questions about what kind of loan you would be eligible for, MoneyMutual offers live chat assistance on their website. Average Rating for " Money Mutual " is 1 out of 5 based on 6 reviews. **********warning warning.......... Stay away from them. Sign the petions out there that are trying to make it force them only be allowed to chage 36% only!!!!! Please stop send me letter from money mutual. No more that enough. THERE IS A PETITION GOING AROUND TO PASSA LAW WHERE THE MOST THEY CAN COLLECT ON ANY LOAN IS 36% please find it on government site and sign it. Thanks. This is a bunch of crap, once you put your info in for the online process you will then have millons of people calling you, texting you or emailing you, that can get pretty annoying! On top of that they dont even provide service in the state of GA. Montell you need to be ashame for putting your name in something. All this false advertising. a lender tried to offer me $300.00 but I had 6months to pay over 2500.00 back. What kind of loan is that!? To the guy above, your exactly right. I tried it a few years ago. I needed 2 hundred dollars and within 2 days they took money out of my account. I owed them almost a hundred dollars...... for what?!?! They never loaned me any money. Not even a penny. but i guess that entitled them to take money from my account. The site. company and ppl are all a scam. They really should be sued. Their all greedy bastards. Money mutual is a scam! Do not get a loan from this site. It is filled with loan sharks just waiting to screw innocent people over. Montel williams should be sued!